I've liked Cheryl Reavis since I discovered her contemporary romances long, long ago, in a galaxy far, far away. (She also writes books set in the Civil War period, but I like the modern ones better.) Books like Blackberry Winter, Promise Me a Rainbow, and The First Boy I Loved are not soppy love stories, but the tellings about real people and realistic situations that sometimes break your heart, but steer clear of the stereotypical Hero/Heroine characters and HLA endings. The men are not rich Greeks with control issues, but real men who have problems with money and child care. The women are not silly teens or young models, but mature women who are doing their best with what life has dealt them, with no wallowing in misery and angst. These are people you'd like to know. The Marine is one of her best. *ARC provided via author & NetGalley in exchange for a fair and honest review*What an awesome and moving story! Very well written, with a competent handling of point of view (but then again, Cheryl Reavis is the author of “The Older Woman”, written in the hero’s POV), with lots of showing. it’s a book about what people are, in their hearts, and how they feel and not about what they look like or how beautiful or handsome they are (physical descriptions are minimal or even absent).I’m not going to say that I loved the hero (or the heroes), because we see so little of him (the older one) and he’s not the eloquent type, but did I enjoy this bossy, caring, no-nonsense and matter-of-fact Marine.I also loved the younger Marine and the other characters. Characterization is superb and you feel like you know this people.I’ve chosen this book because of the author and the blurb and it was a really rewarding (and addictive) read, a compensation for a series of previous bland stories that I had been reading. 4.5 stars.I'm grateful to the author, the publisher and NetGalley for providing a free copy. Although there was a thread of romance running through it, that was not the main focus of this book. Rather it focused on families both lost and found and what family really means. I loved all of the main characters. I'm amazed at how much story and characterization the author managed to pack into a relatively short page count. I can't wait to read the second book. Another romance as refreshingly different as The First Boy I Loved. Ms. Reavis delved into the emotions of adults who felt uncared about as kids and how that changes their outlook on relationships and trust. I loved Josh - a devoted father and dedicated Marine, Grace, the new widow, her two daughters and especially Joseph - a retired Marine who's made it his job to care for other Marines who have been broken in spirit and body. The refreshing part of Reavis stories is that her heroines and heroes are not all fresh, young, innocents, but older, having been battered around a bit by life, yet strong, resilient and willing to put their hearts on the line again. I was so captivated by her characters I was not ready for the book to end and would have been happy to mingle with them for a while longer. DON'T miss this fabulous story. 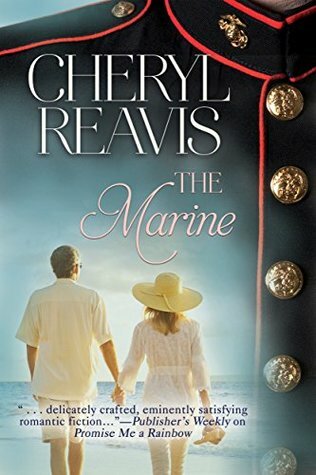 The Marine is my first read by Cheryl Reavis and what a refreshing read. I was pulled in with the honesty and genuine characters and the well written storyline, staying there and experiencing their journey. I very much look forward to reading more by this author. I received a free copy via Netgalley in exchange for a honest review.This was a very easy read.The interaction between the characters made the story fly past.Great holiday read. Cheryl Reavis - AKA Cinda RichardsFormer public health nurse, now award-winning romance novelist, Cheryl Reavis, describes herself as a "late bloomer." Her Silhouette Special Edition™, A CRIME OF THE HEART, reached millions of readers in Good Housekeeping magazine and won the Romance Writers of America's coveted RITA award the year it was published. She has also won the RITA award for her Harlequin-Silhouette novels, PATRICK GALLAGHER'S WIDOW, THE PRISONER, and THE BRIDE FAIR. BLACKBERRY WINTER, THE BARTERED BRIDE and a Berkley novel, PROMISE ME A RAINBOW, have been RITA award finalists. She has received numerous awards from Romantic Times magazine. Her award-winning literary short stories have appeared in The Crescent Review, The Bad Apple, The Mosaic, The Sanskrit, Laurels, The Emrys Journal and Writer's Choice. Publishers Weekly described her Berkley single-title novel, PROMISE ME A RAINBOW, as " example of delicately crafted, eminently satisfying romantic fiction."